Ryukyu Life: Travel Photo + Question: Will the World Run Out of Coke ? Travel Photo + Question: Will the World Run Out of Coke ? If you are a traveler, try and think of a country you've been to that doesn't have Coca Cola. 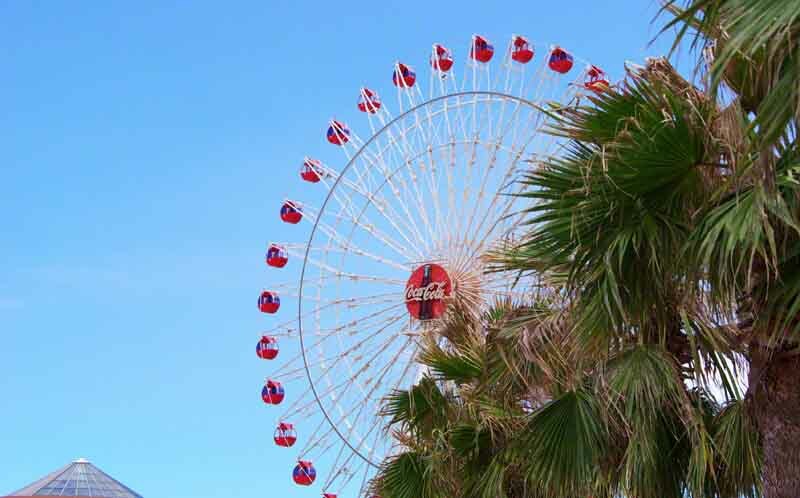 This Ferriswheel photo was taken at a shopping center in Okinawa, Japan. But, I can't think of any country I've visited that didn't have Coke. People worry about the world running out of water, rainforests, coal, oil, whales, icebergs and polar bears and that's good. SAY, IF THE WORLD RAN OUT OF COKE ? Kids would be calmer, there would be no need for dentists and there would no eyesores like this monstrosity in Okinawa....yep the world would be a better place without the stuff. Yeah, I tend bar and always wonder why someone would take a good whiskey like Jack Daniels and ask to have Coke poured in it. Ya'll don't put that stuff in yer Scotch. Do ya? Now, the good Dr sometimes, I have a sip or two as a hangover cure! No not in the whisky Mike but I have been known to add a little in my Morgans Spiced Rum from time to time mmm. Shared with my SU followers. First I heard of that. Interesting. Some peolple blame the cows expelling gas. Coulda been carbonated drinks, all along! That's a popular drink, Morgan and Coke, over here. Not with the locals; the foreigners. LOL You had me going, thinking that Captain Morans came from over your way so, I went behind the bar and read the label. The stuff come all the way from Puerto Rico. I learnt something today! How am I supposed to focus on anything today when you've got me worrying about running out of Coke? Your photo reminds me of the 80 foot wooden Coke bottle at AT&T ballpark. They certainly do their share of advertising. What a cool photo & Ferris wheel! I went to the World of Coca-Cola in Atlanta, Georgia last month...they should have one of these too! Now, I'm starting to see how popular it is with bloggers. Sometime, I'll have to go do a night shot of it and see if they light up the Coca Cola embem. Thanks. Glad you know about aspertame. I never heard of the stuff but, will avoid it if I ever run across any.